Mutiny on the Bounty (1935) follows the extraordinary, true story of a mutiny aboard the Royal English Navy ship HMS Bounty in 1789. The story was made famous in the popular imagination by the “Bounty Trilogy” novels of Charles Nordhoff and James Norman Hall (Mutiny on the Bounty, 1932; Men Against the Sea; 1933, and Pitcairn’s Island, 1934). Although this fascinating subject was subsequently filmed several times with big budgets and big stars, none of those productions ever matched this 1935 production. All treatments of the story address the basic issue: under what circumstances is a mutiny aboard a ship justified? In many cases the task of answering this question is simplified by the fact that one side of the confrontation does not survive to tell its side of the story. This was not case with the Bounty mutiny – a court proceeding with surviving witnesses was held back in England to adjudicate the charge of mutiny aboard the royal vessel. In fact the true account is a fascinating and complicated tale about discipline, duty, and adherence to basic principles of humanity. Although the 1935 filmed version of the story took more liberties with the historical record than did later versions in 1962 and 1984, to me it still stands as the finest expression of the tale. It does so by its superb presentation of the conflict between the principal adversaries, Lieutenant (“Captain”) William Bligh and First Mate Fletcher Christian. The film received nine US Academy Award nominations and won the Oscar for Best Picture. Director Frank Lloyd received his fifth Oscar nomination for Best Director, and Jules Furthman, one of my favorite screen writers, was (along with co-scripters Talbot Jennings and Carey Wilson) nominated for the Best Screenplay Oscar. 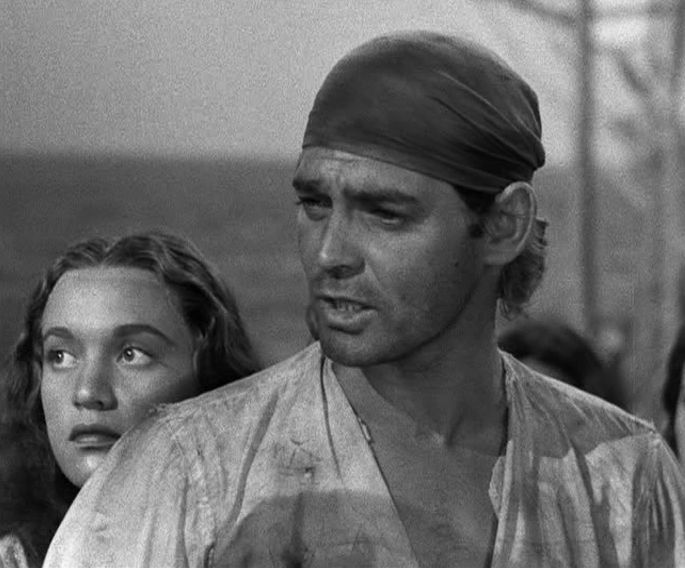 But what really stands out in this particular Mutiny on the Bounty are the acting performances of Clark Gable and Charles Laughton. In all the course of all their justly touted screen portrayals, neither Gable nor Laughton surpassed what they did here. The film narrative passes through five stages that progress from the buildup to the mutiny, then to the event itself, and finally its aftermath. In 1787 the HMS Bounty is ready to depart from Portsmouth for a two-year voyage to the South Pacific. The goal is to collect breadfruit trees in Tahiti and deliver them for planting in the British colonies in the West Indies to feed the slaves. This was classic British mercantilism: they were not seeking gold, but looking to tighten the net of their empire. The opening sequence introduces the principal characters, including Captain Bligh, the First Mate Fletcher Christian, and Midshipman Roger Byam (Franchot Tone), whose upperclass background is supposed to represent the more principled aspect of British society. In addition there are two other ship’s mates, along with the ship’s surgeon, its clerk, its chef, and several commoners who have been “impressed” into service (forcibly rounded up like slaves and “drafted” into service on the ship). Just before the ship sets off, we get a glimpse of the harsh discipline that is believed to maintain order on the king’s ships and the degree to which Captain Bligh believes in that ethos. A sailor from another ship is sentenced for some misdemeanor to be severely whipped by other ships in the harbor. 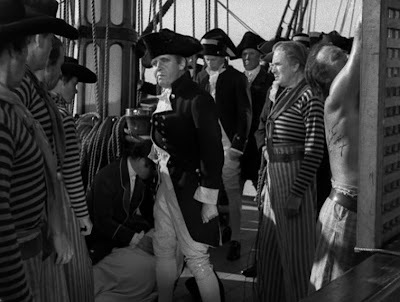 By the time this miserable wretch is brought to the Bounty, he is already dead, but Captain Bligh orders that the full whipping be administered anyway. The voyage around Cape Horn to the South Pacific features a number of incidents displaying Bligh’s sadistic and vengeful demeanor. Bligh is aware that he comes from a lower class than Christian and Byam, and he resents them all the more for that. He assigns the poor impressed sailors, who are inexperienced in their jobs, to half rations; and then he orders a sailor who used too much water to be keelhauled under the ship’s bow, which unsurprisingly kills the man. Christian and Byam witness and suffer under these conditions, but they can do nothing. When the ship arrives in Tahiti, it is clearly a paradise for the half-starved crew. They are welcomed by the locals, and they joyously set about collecting the breadfruit trees to be taken back aboard the ship. 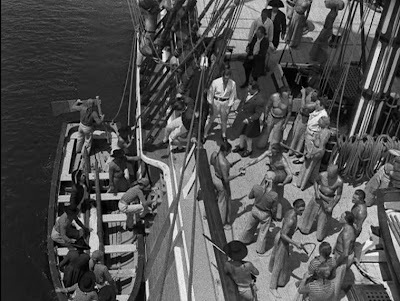 By now Bligh and Christian are at loggerheads, but Christian manages to get ashore and quickly romances a beautiful Polynesian girl, Maimiti (Mamo Clark). Byam, too, meets and (more chastely) romances a beautiful girl who is the chief’s daughter, Tehani. 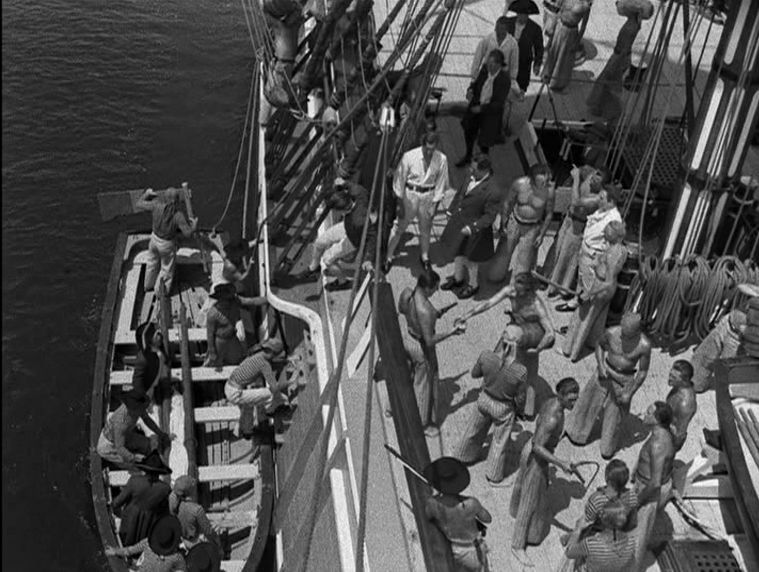 As the return voyage begins, Bligh continues his sadistic treatment of his crew. His fanatical demands for respect lead to the death of the ship’s ill surgeon, and this puts Fletcher Christian at the breaking point. Many of the crew urge Christian to lead the mutiny, and he finally agrees. Bligh is captured by force and cast off into an open boat along with several other loyalist shipmen. Their seemingly hopeless task is to somehow sail their small boat in the middle of the Pacific Ocean all the way to the East Indies. But thanks to the able seamanship of Bligh, they manage to accomplish one of the most amazing sailing feats in history and reach the Dutch East Indies after sailing some 3,500 miles over seven weeks in open water. Meanwhile the Bounty, now captained by Christian, returns to Tahiti and a new life. After about a year, Christian and Maimiti have a small child and are living and loving happily. After managing to get back to England, Bligh captains another ship, HMS Pandora, and sets out to find the mutineers and bring them back to “justice”. When Christian and his men get word of the coming arrival of the Pandora, they set out on the Bounty and try to escape. Byam and some other men who wish to return to England remain on Tahiti, and they are immediately imprisoned on Bligh’s arrival and brought back to England in chains. Fletcher Christian, along with his crew and some Tahitian friends manage to get away from Bligh’s pursuit and settle in safety on the uninhabited Pitcairn island. On returning to England, Bligh’s captives are all sentenced to death, but Byam gives an impassioned speech before the royal court about humanitarian principles, and he is eventually pardoned . The other sentenced men, though, are all hanged. 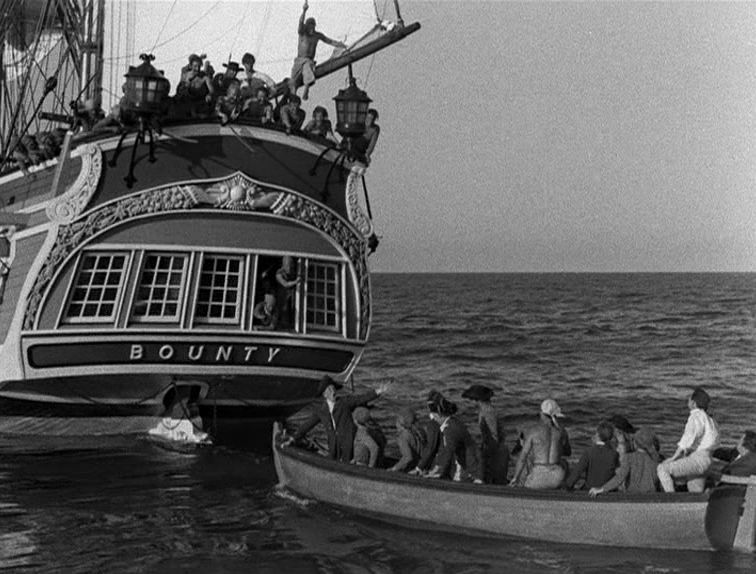 Outstanding features of Mutiny on the Bounty are the dramatic on-location cinematography and dynamic editing. This was an example Hollywood studio production values at their apex. 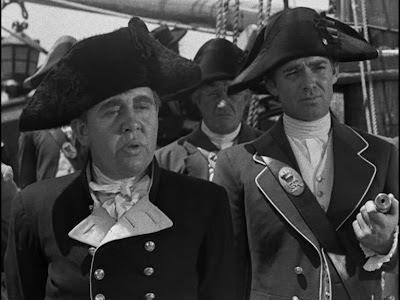 But as I mentioned earlier, what makes this a classic story is the dramatic interplay between Charles Laughton, as Captain Bligh, and Clark Gable, as Fletcher Christian. 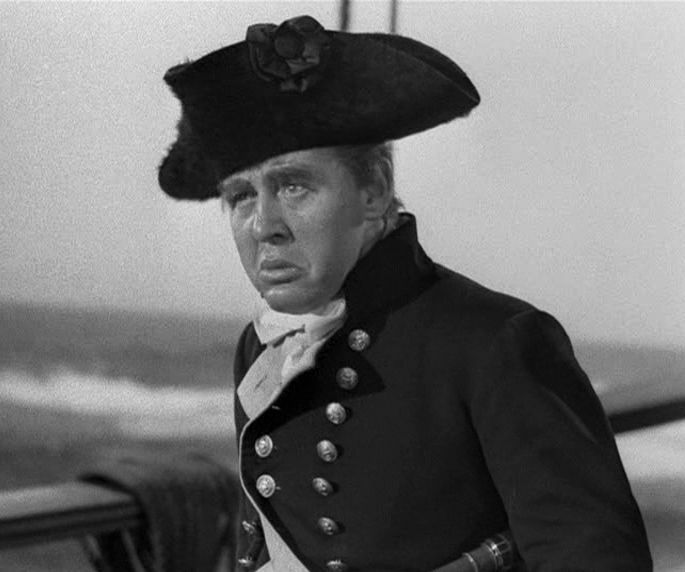 Laughton’s posture and gestures are perfect for the depiction of a defensive, mean-spirited individual who seeks to use the rules of the Royal Navy to force subservience and fear. In fact he tells Christian early on that to command is to rule by fear. His character is the epitome of a man with no self-respect and a hatred of all those around him who remind him of his despicable nature. I have seen Laughton in a number of screen roles, but this one stick in my memory the most. On the other hand, Clark Gable comes across as a straightforward and authentic individual who seeks fairness and commonality with his coworkers and those under his command. Although Gable generally favored his (what he must have considered to be) rakish moustache, he looks much better clean-shaven, as in this film. When you see him in this film, you can’t help wondering just how even better he would have looked in his other films without the ‘stache. Unfortunately, I find Franchot Tone’s performance as Robert Byam to be a detriment. 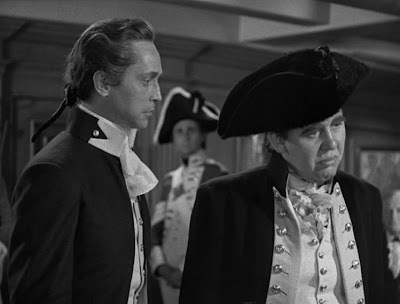 Although he is supposed to represent a man torn between loyalty to the rules of society (and hence obedience to Captain Bligh and the law) and human comradery (and thus friendship with Fletcher Christian), his middleman role doesn’t serve any real purpose here. We viewers can assume that middle position without his help. In fact Tone is too much of a jolly good boy scout in this setting, and his performance distractingly reminds me of Hugh Laurie’s “George” character from the Blackadder television series. While Laughton and Gable draw the viewer in to an immersive involvement in their dramatic interactive contexts, Tone's performance merely distances the viewer from such an immersion. Overall, the adversarial contrast between Laughton and Gable sets the tone for the entire film. Innate humanitarian justice comes across as the winner here, while the manipulation of rigid, inhuman rules is seen as a tool for oppression. We know in fact that some discipline is necessary, particularly back then on long sea voyages manned by undiscipined crews, but in this film, the appeal to our innate sense of empathy and compassion is eloquently made with full cinematic force. The natural “paradise” of Tahiti, the innate romantic attraction between Christian and Maimiti, and the common spirit felt between the Tahitians and the ship’s crew all contribute to our romantic feeling of intrinsic compassion and justice. The real, historical William Bligh went on to further promotions and success in the Royal Navy. He was eventually appointed to be Governor of New South Wales in the Australian colony. But his behavior apparently was unchanged. While serving as Governor, he brought on another mutiny, the Rum Rebellion in 1808, which was the only successful armed takeover of government in Australian history. As for the historical Fletcher Christian, he and his friends survived on Pitcairn island, and mixed European-Polynesian descendants live there to this day. There are conflicting stories concerning Christian’s ultimate fate – he may have been killed in a dispute on the island, or he may even have sometime later made his way clandestinely back to England. Whatever happened to him, we can’t help standing behind his quest presented in this film for an honest, humane, and compassionate society of mates on an equal footing. The person on whom the character Roger Byam was based, Peter Heywood, abandoned the idea of returning to his Tahitian wife after his pardon and resumed his naval career. He eventually rose to the rank of flag captain (captain of an admiral's flagship). There was another film on Bounty featuring Anthony Hopkins .. but I guess it wasnt as impressive as the older one. Informative post. Do you have a FB Page / Twitter account I can follow ?